Christians often think of the Word as information or history. But the Lord Jesus Christ is the Word, and within Him are all the treasures of wisdom and knowledge. 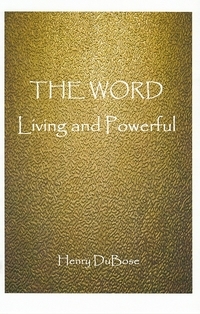 The Word, then, is more than a language that speaks of God. It is an emanation of God and it is our access to live in His presence. If we are receiving only from the natural side of the Scriptures, they will speak only to us of history, future events on a natural plane, and disciplines for a religious life apart from the presence of God. When we feed upon the Spirit-Word of the Scriptures, we experience change and a present reality of the presence of the Lord. Click here to order the printed copy.